It’s time for another post featuring shiny customer projects! Who doesn’t need a Centurion in their life? Mustashriqa has one of her own to wrap up with on a cold night. Hey! Who turned out the lights? Not AbbyNormal! 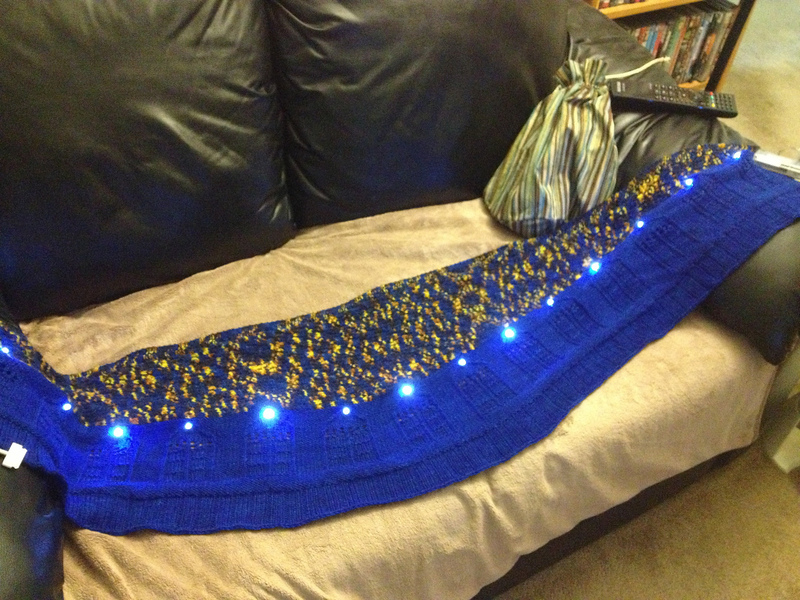 She can light the way with her Bigger on the Inside shawl that she incorporated LEDs into for the top of each police box. Exploring all of time and space universe requires comfy feet in hand knit socks. Knittitude knit these fun socks with Stringy but Tasty from the Summer round of WYD club. Tasty, tasty socks! To get your project featured on the blog or to nominate another project to be featured please post your nomination or your own project in the nomination thread in the NGY Ravelry group. Users who get their projects featured will receive a $5 gift certificate to Nerd Girl Yarns. Stay tuned, the Fall round of WYD club opens for sign-ups on August 15th at 2pm at the shop!